Lying at Pearl Harbor as tender to Third Submarine Division, August 1917. Type and Characteristics - Single screw, iron-hulled (Conway's - wooden-hulled, but confirms that classed as iron gunboat by USN) sloop, Alert-class, built by John Roach & Son, Chester, PA, laid down September 1873, launched 18 September 1874, commissioned 27 May 1875, 1,020 tons, 199ft long x 32ft beam x 13ft draft, armed with 1-60pdr rifled, 1-11in and 2-9in smoothbore guns, and spar torpedoes, first commanded by Cdr William T Sampson. Log Period and Areas of Service - 1875-1922, North Atlantic Station, Asiatic Squadron, Pacific Station, coasts of Central and South America, Hawaiian waters, Alaskan waters, Bermuda. 1875-76 - North Atlantic Station as midshipman training ship. 1876-79 - Asiatic Station via Suez Canal. Cruised waters of Japan and China. 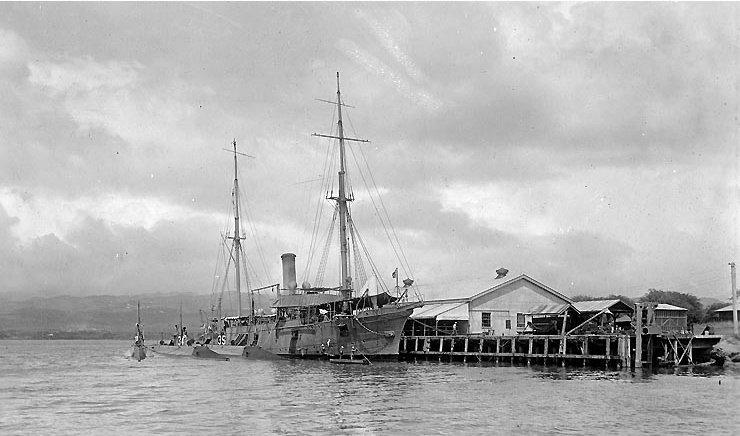 1879-82 - Repaired at Mare Island Navy Yard, before returning to Asiatic Station. Visits included Indochina, Thailand, Singapore, Dutch East Indies and Philippines. Also survey work in the Bonins. 15 April 1882 - On passage Kobe to Yokohama, damaged in collision with Japanese Emperor's yacht. 1882-83 - Out of commission at Mare Island. 1883-86 - Returned to Asiatic Station and spent 20 months mainly in the East China and Yellow Seas. Returned to San Francisco in September 1886 and placed out of commission. 1887-89 - Served in Pacific Station, protecting US interests off the coasts of Central and South America. 11 August 1888 - Sailed from Callao, Peru for Hawaii, then an independent kingdom, staying there until spring of 1889. 18 April 1889 - Departed Honolulu for Samoa to provide assistance to the surviving US warship, USS Nipsic, damaged in the hurricane that struck Apia on 15 March. Two other US and all three German warships present were sunk. 2 August 1889 - Eventually reached Honolulu with the USS Nipsic, and stayed on in Hawaiian waters. Arrived back in San Francisco on 9 December and decommissioned 6 February 1890. 1890-93 - Recommissioned for Pacific Station service, but in June 1891, spent two months in the Bering Sea on seal protection duties. Then departed for Asiatic Station for the next two years. Returned to San Francisco on 21 September 1893 and again decommissioned at Mare Island. 1894-96 - Returned to Pacific Station and spent summer of 1894 in Bering Sea, again protecting seals. Returned to San Francisco in September, remaining there until January 1895 when assigned to the Pacific coasts of Central and South America. Returned July 1896. 1896-98 - After two months in San Francisco Bay area, made a round-trip to Port Angeles, WA, then carried out gunnery exercises in Hawaiian waters in December 1896. Spent the remainder of this period in Hawaii, returned to San Francisco, made a return trip to Sitka, Alaska and then patrolled the Pacific coast of Central America. Reaching San Francisco in May 1898, she was shortly decommissioned, and remained so for three years. 1901-03 - Pacific Station along Californian coast training apprentice sailors. Decommissioned at Mare Island until 1907. 1907-1910 - Loaned to California Naval Militia. 1910 - Returned to Navy, but not reactivated for two years. 1912 - Fitted out as submarine tender. 1912-1917 - Submarine tender for Torpedo Flotilla, Pacific Fleet. December 1917 - Sailed for Bermuda as base and repair ship. April 1918 - Returned to west coast to resume duties as submarine tender to Pacific Fleet Torpedo Flotilla. Remained in this role for four years. Fate - Decommissioned at Mare Island Navy Yard in March 1922, sold July 1922.